Is Alma del Pueblo's Foodie Dream Half Full of White Elephants? Everyone wants to see the Santa Barbara Public Market succeed, even those lining up to escape it. After one full year of business, all 11 of the market’s independent merchants still admire the ambitious commercial concept — one of the biggest and most expensive in city history — and hope desperately to make it work. The high-ceilinged Victoria Street space just off downtown’s main drag is packed with vendors selling all manner of gourmet food. There’s a butcher and a fishmonger, a bread baker and a juicer, as well as purveyors of cheese, olive oil, and produce. But five of those tenants are so dejected by how things are going and feel so mistreated by property owner and developer Marge Cafarelli that they’ve banded together in protest and retained an attorney to weigh their legal options. They say the market’s foot traffic is consistently low, sometimes alarmingly so, and that their lease rates are much higher than what was promised in their contracts. They claim attempts to speak with Cafarelli about those concerns and others have gone nowhere or been completely rebuffed. 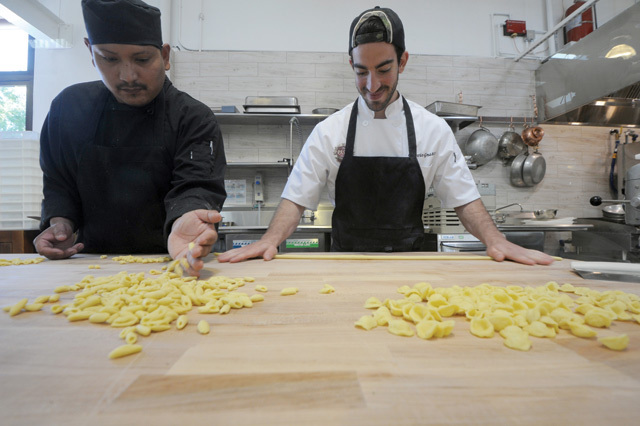 On April 1, the Pasta Shoppe sued Cafarelli and the Public Market for breach of contract. Pasta Shoppe owner Diane Harding, who cofounded Madison’s Sports Grill & Tavern and managed it for 15 years, is trying to rescind her lease and force Cafarelli to repay her the expenses she incurred but never agreed to. Harding claims that when she signed her five-year lease in January 2013, Cafarelli assured her 1,500-2,500 potential customers would walk through the building every day. That number doesn’t crest 1,000, the lawsuit states. Other merchants say it usually hovers around 500. Represented by James Smith of Santa Barbara law firm Grokenberger & Smith, Harding also claims that Cafarelli pledged to host a grand opening last April with Governor Jerry Brown in attendance. When Brown didn’t RSVP, the unveiling was relegated to a lackluster event that failed to generate much attention. Plus, other tenants have said, Cafarelli sprung the opening on the merchants with only a few days’ notice, and so their first impression on local and what should have been repeat customers was disorganized and not up to their usual standards. Cafarelli and her publicity team have since failed to effectively promote the Public Market to Santa Barbarans and tourists alike, the lawsuit charges. Harding currently pays $2,782.50 a month in base rent for 584 square feet of floor space where she and her staff — including a head chef who trained in Tuscany and worked at the Four Seasons Biltmore — make and sell fresh handmade pasta. Harding had personally auditioned her food for Cafarelli, who prided herself on selecting the “best in class” to fill the market’s stalls. Michelle O’Connor, Harding’s publicist, said the Public Market was built and billed to be like San Francisco’s Ferry Building Marketplace, with artisanal vendors peddling top-shelf food and high-end wares from stalls alongside anchoring restaurants. It hasn’t played out that way. Instead of buying ingredients to cook at home, customers more often use the Santa Barbara market for sit-down meals, she said. And the merchants who set up their spaces to sell groceries, not host diners, have had a hard time adapting to the food court model. “A lot of the places can’t pivot to accommodate that [change],” O’Connor said. Many of the vendors signed their leases knowing they wouldn’t get rich, but they thought they’d at least turn a profit based on the promised foot traffic and triple-net figures, O’Conner said. Some of the merchants are reportedly losing up to $7,000 a month. They’re watching how Harding’s lawsuit proceeds before potentially starting the expensive process of breaking their own leases. They’re also keeping a close eye on the two big retail spaces next to the market that are still sitting idle. One of the storefronts was supposed to house a Full of Life Flatbread restaurant. That plan never materialized, and no other restaurant has been selected to take its place. 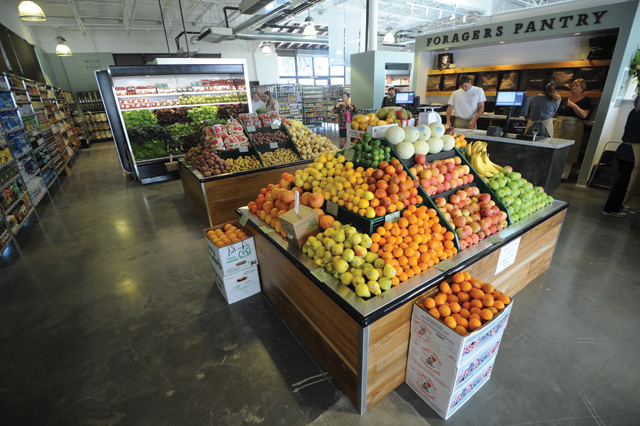 The Public Market is on its third manager, O’Conner continued, and Cafarelli’s publicist is careful to make sure no criticism of the operation finds its way into media reports. 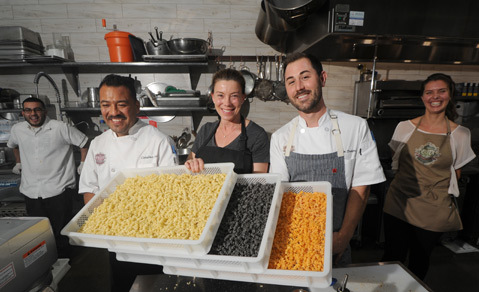 For an interview with The Santa Barbara Independent last December about the Pasta Shoppe’s supposed successes, Harding was pressured to “basically fake it,” O’Conner claimed. O’Conner conceded that any new venture as large and as aspiring as the Public Market is bound to endure some growing pains and that it’s unrealistic to expect every vendor to remain a permanent fixture enjoying wild success. However, she said, it’s surprising and sad that, a year since the market’s opening, so many merchants remain deep in the red with little sympathy or support from Cafarelli, who has reportedly told them to lower their prices and “dumb down” their products. “There’s something wrong with the equation,” O’Conner said. On the other side of the aisle, a few of the vendors at the Public Market are doing exceptionally well. Empty Bowls is always packed, Rori’s Artisanal Creamery is selling like crazy, and Enjoy Cupcakes is happy to report business is booming and only getting better every month. 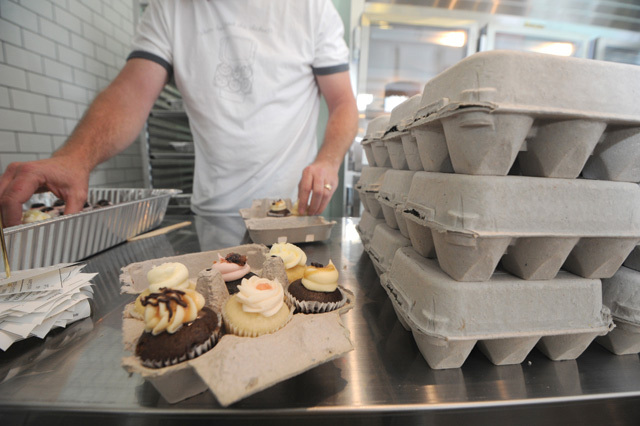 “Things are going amazing,” said Enjoy Cupcakes owner Kevin Vander Vliet. “We love it.” Sure, the triple-net charges are high, he said, but the Public Market — which is LEED Platinum certified — is a unique setting with unique expenses. “It’s a wonderful place,” he said. Other vendors similarly happy with the status quo gave much credit to Cafarelli for getting the market and the Alma del Pueblo mixed-use project — six years of planning and two years of construction in the making — finally off the ground. Comparing it to a start-up and describing the varying levels of successes so far as simply a “mixed bag,” they say it’s premature to make any sweeping judgments. “Take Paseo Nuevo,” said one merchant. “Stores go in and out of there all the time. Does that mean the whole place is doomed?” The content vendors also said that their business models are simply superior to those of their struggling neighbors. And it’s up to each merchant, not Cafarelli, to build up his or her individual space and figure out how to make sales, they said. For her part, Cafarelli said she could not comment on the pending litigation or the terms of the Public Market’s leases. She said the three shops she owns and runs — Wine + Beer, Foragers Pantry, and Culture Counter — are “trending positively” with a “meaningful customer base.” “This is a big deal for three businesses that are brand new to Santa Barbara,” she said in an email. Cafarelli also operates the market’s rentable commercial kitchen. Overall, Cafarelli said she is “very pleased” with how the first year at the Public Market has gone and envisions only better times ahead. “We have a great group of small businesses as tenants that continue to amaze me each and every day,” Cafarelli said. “The dedication and work ethic that it takes to succeed in a small business today is enormous and they have my respect.” As can be expected for “a unique venue of this type,” she explained, some merchants are faring better than others. Last year, Alma del Pueblo’s general contractor and two of its subcontractors sued Cafarelli’s development company, Victoria Street Partners LLC, for unpaid work. 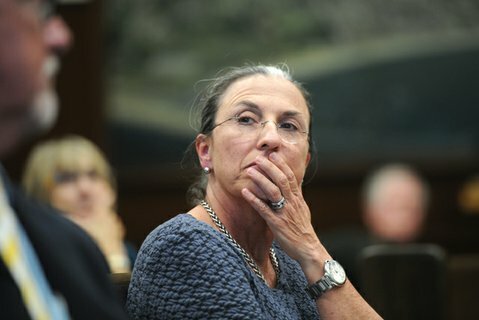 It’s not clear if or how those cases were resolved, but at the time, Cafarelli assured that there was money to pay everybody, her construction loan was in good standing, and the legal issues were just a messy final phase of a massive and complicated building project. On the residential side of Alma del Pueblo — which holds 37 condominiums ranging in price from around $800,000 to $2.6 million — Cafarelli said she’s sold 20 to date. Fifteen of the units sold at market prices, and five closed escrow as middle-income homes. The condos have been on the market for more than three years, and “Alma del Pueblo is gathering momentum each month,” Cafarelli said.